Victorian houses account for around one in every six homes in Britain, and the majority are either terraced houses or semi-detached. These properties offer a combination of period charm, authentic architectural details, affordability and the potential for renovation. However, there are some drawbacks to Victorian homes – narrow, dark kitchens and some smaller rooms tend to populate the back end of these houses. Fortunately it’s nearly always possible to overcome these negatives by extending a house – and Victorian houses really lend themselves well to being extended. Use this guide to find out how to extend a Victorian house successfully. Where to start when extending a Victorian house? If you live in an end terrace or semi-detached house with a bit of garden space next to the main side wall there may be some limited potential for building a single storey extension. 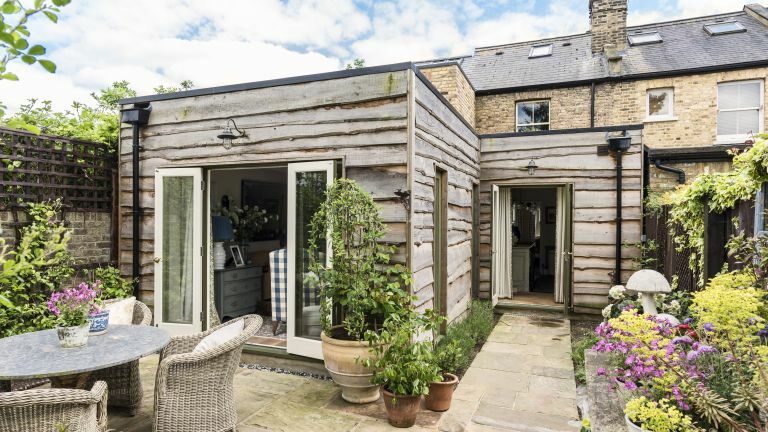 This might mean building a kitchen extension across the full width of the back of the house, or extending into a side return for more living space or a larger kitchen, without losing valuable garden space. In properties where this is feasible, the new accommodation should be carefully integrated with the original house. What you want to avoid is finding yourself with the new rooms inconveniently accessed off an existing bedroom or dining room. This potential at the end of a Victorian house or alongside the thin rear addition can allow for a new kitchen, and may have the potential for a small bedroom above. This side return area has the biggest potential versus outlay to transform the house. In smaller terraced houses, filling in the side return may only add a couple of metres to the kitchen width, but it should still be enough to radically improve the size and feel of the interior. You can also extend around the back of the house where garden space allows. Before you start an extension project, remember to notify your insurance company. Not doing so could invalidate your policy (for example there may be a clause about occupancy and you may need to move out for an extended period of time). You may need renovations insurance, too. How much will an extension to a Victorian house cost? You can get a good idea of the extension costs involved by using our extension cost calculator, but bear the points below in mind. Because of the restricted space and the various challenges outlined below, labour costs tend to be comparatively high for extending terraced houses and semi-detached Victorian houses. A lot will depend on the size and complexity of the extension, and your geographical location. With builders currently in great demand expect to pay about £2,000 per square metre (including the existing areas being refurbished). The most expensive items in any project tend to be the walls, foundations and roofs – each accounting for around 10 per cent to 15 per cent of the total outlay. Specifying premium quality bi-fold doors and exotic glazing can also significantly add to the price. The cost of a new kitchen is likely to come in significantly above 10 per cent of the total outlay. Independent RICS survey: £500 to £1,000. Planning application: £172 to £400 (you can calculate the fee using the planning portal‘s online fee calculator). Knocking down a wall and inserting an RSJ: from £3,000. Building regulations: £700 to £1,000. In most cases you’re allowed to build surprisingly large side and rear extensions without the need for planning permission under permitted development rights (PDR). In cases where a full planning application is required it’s worth discussing your ideas in advance with a Planning Officer so they can guide you as to what’s acceptable. For more ambitious proposals it’s best to appoint an Architect to handle this stage; if the application is refused they can advise you whether it’s worth going to appeal. Once planning consent has been granted it normally remains valid for a period of three years. Planning rules are a lot stricter in Conservation Areas where any alterations visible to the ‘principle elevation’ (normally the front, but sometimes also the side on corner plots) will need consent. Permitted Development Rights in Conservation Areas are more limited and rear extensions are restricted to single storey only. With Listed Buildings it’s safest to assume that all works, including any internal alterations, will need Listed Building consent. A Building Regulations application is required for all extensions and structural alterations to a house. Your design will need to comply in a wide range of areas, including thermal efficiency and insulation, ventilation, drainage, fire safety, and the structural stability of beams, floors, roofs and walls etc. You normally need to provide detailed drawings accompanied by engineer’s calculations, something best handled by an Architect or Surveyor. A ‘full plans’ application (which typically takes 5 weeks to process) is usually safer than relying on the quicker ‘Building Notice’ method, unless you appoint a ‘package deal’ contractor with extensive experience of similar extensions in the local area. Approval of works such as electrical wiring, replacement windows and heating installations are normally delegated via ‘approved installers’ who can ‘self-certify’ that work has been carried out in compliance with the Building Regulations. You need to notify Building Control at least two days prior to starting work on the extension to your house, and then at key stages so they can come out and inspect the works as they progress. One of the key considerations when designing new bathrooms or kitchens in an extension to your house is to plan all the services in advance. The position of sinks and appliances must be integrated with pipework for the hot and cold water, waste plumbing, electric supplies, gas or oil pipes. Cooking and bathing are the biggest contributors to indoor water vapour, so Building Regulations require extractor fans to be installed in the battle against damaging condensation. Consider too how best to accommodate heavy cast iron soil and vent pipes (SVP) which take waste from the bathroom. These can often be incorporated within the extension and boxed in. The existing electrical system will need to be extended to provide new lighting and additional power sockets. Electricians can normally self-certify their installations, and upon completion of the job it’s a legal requirement for the electrician to test the new system and hand over a signed BS 7671 electrical safety certificate. A boiler flue will often be in the way of your extension. You can look to move the existing boiler but the increased demand from the enlarged house may warrant a new boiler with a greater heat output. Therefore you may need to budget as much as £4,000 or £5,000 for installing a new boiler. Select builders who have good experience of extending similar Victorian houses. When comparing quotes, check exactly what’s included in the price – does it include VAT, scaffolding, clearing rubbish, skip hire and cleaning up? Don’t feel obliged to go for the lowest price. Agree payment stages in advance and only pay for completed work; never pay up front. Check that your builder is insured for risks to persons and property. Ask for copies of certificates for public liability and employers’ liability cover. Be very clear about what work you want done and don’t keep changing your mind or you will be hit with lots of expensive extras. Use a written contract with main contractors or detailed letters when appointing trades. Confirm the start and finish dates in writing, along with the agreed price and arrangements for payment. Extending a Victorian house, especially a terraced house, can be a complex operation, so it’s normally advisable to appoint an Architect or Chartered Surveyor to manage the process. There is the option to employ ‘full package’ Design & Build contractors who specialise in this type of work and will be familiar with the various challenges. They should also be able to take care of Planning and Building Regulations compliance. Where such a firm has undertaken a number of similar projects in the local area you should be able to go and see examples of similar Victorian houses they’ve extended to get a clear idea of how your new extension will look – plus you can ask the homeowners how the job went. More sophisticated designs are likely to require the services of a qualified Architect to draw up plans, write a specification, tender the job to selected contractors and manage the construction process. Pick someone with good experience of similar projects. Architects typically charge around 10 per cent of the total construction cost for a ser­vice involv­ing design and supervision. If you only need drawings expect to pay from about £2,000 for planning plus a similar sum for building regulations drawings. You can find the charges for Planning and building control fees on your local council’s website. Do you need a party wall agreement? The Part Wall Act is a legal requirement which applies if you carry out building work to a wall shared with neighbours, such as those separating terraced houses or semis. It also applies when excavating within 3 metres of an adjacent property where your new foundations are deeper than those next door (in some cases within 6 metres). It can also relate to works affecting walls on boundary lines between gardens. A legal notice will need to be served on the owners of the adjoining property at least two months before the work commences. This normally means having to appoint a Party Wall Surveyor to manage the process. To find Chartered Surveyors specialising in Party Walls visit rightsurvey.co.uk. Some smaller terraced ‘workers’ cottages’ were built very cheaply, with thin brickwork to the rear addition. As these are the walls that will be structurally altered for the extension they need to be handled with great care. Where the back bedroom upstairs has got thin walls it’s worth having them strengthened and insulated as part of the works. When a modern extension with deep foundations is added to a Victorian house with old shallow footings there’s a risk that cracking can develop over time at the point where the two structures meet because of the different foundation depths. It’s advisable to incorporate some form of flexible joint that can accommodate a small amount of movement without cracks developing. Structural issues can sometimes arise where you need to excavate trenches for foundations or drains in close proximity to a neighbouring property, particularly if there is an old conservatory or outbuilding nearby. To avoid subsequent disputes consult a structural engineer to assess the risk and decide if any temporary support is needed. Where a neighbour has already built an extension along your garden boundary you might need to build up to it. If it then becomes the new dividing wall separating the two extensions it will need adequate sound and fire resistance. Awkward access and restricted parking for Victorian houses can add as much as 5% to the overall quote to compensate the builders for any hassle, extra time and inflated labour costs. It’s sometimes possible to arrange access via back gardens where there’s a shared right of way running across the back leading to a side road or alley, or it may be possible to agree temporary access via the neighbour’s garden. Otherwise materials and equipment will need to be transported through the house, having first taken measures to protect floors, fittings and wall finishes. When it’s time to pour concrete for the foundations the concrete wagon will need to run a pumping hose through the house. Any building components which are particularly large or bulky can be craned over the top of the house for significant extra cost. Consider how to dispose of excavated soil from the foundations which may have to be barrowed through the hall, and ensure that deliveries of building materials don’t all arrive at once completely blocking your front garden. It is often necessary to divert at least one rainwater downpipe. This will probably necessitate digging a trench for a new underground pipe so water can be channelled out to a soakaway in the garden or to a handy ditch. Excavation can be done using a mini digger at the same time as the foundations. From the base of the SVP there will be an underground foul drain which in Victorian terraced houses typically runs out via the back garden where it connects to a main sewer. Great care is needed when excavating and building over fragile antique clay pipes; given their age it’s normally advisable to budget for some replacement pipework and for the installation of a new inspection chamber in the garden so any future blockages can be cleared. When extending a Victorian house there is a balance to be struck between ‘modernising’ and preserving all the wonderful old features – fireplaces, sash windows, decorative cornicing around ceilings, picture rails, floorboards, geometric floor tiles etc. All of which add to the property’s value. The general rule is to conserve the front two thirds of the old Victorian house and modernise the hindmost third. That way you get the best of both worlds, period charm married to 21st Century liveability. Find out how to create good flow in your open plan extension with our practical guide. It is generally best not to take out internal walls and chimney breasts in Victorian houses as they are both structurally important and an interesting part of the property’s history. If you must remove some then seek advice on which internal walls can be removed. Enlarging the back of the house with a side return and/or back extension shouldn’t require any reconfiguration of the main interior layout. How do you want your extension to look from the outside? Internally it’s very common for new kitchen/diners or family rooms to have a clean, modern feel. But externally a ‘sympathetic’ Victorian style that harmonises with the Victorian house is often the safest option. Brickwork or render designed to match the old house work well, and pitched roofs clad in traditional slate or flat roofs covered with metal sheet (ideally lead) can enhance the home's period qualities. Good modern design can also sometimes work well, although consider carefully how it may appeal to future buyers in years to come. Skilfully applied white render, perhaps concealing thick layers of external wall insulation, can contrast nicely with old brickwork. Even radical glass extension designs can sometimes be acceptable to the Planners on the grounds that their ‘invisibility’ complements original architecture. This isn’t a cheap option, though, and complying with heat loss targets will be a major challenge. Check out these Victorian extension designs for ideas for both indoors and out. Single or multi storey? Most extensions of this type are single storey, partly because extending the kitchen is the prime objective and also because they tend to be uncontroversial with Planners and neighbours. If you decide to build more than one storey avoid creating awkward ‘through rooms’ where the new space can only be accessed via an existing bedroom. How far can you build out? In some case you may be allowed to build right up to a side boundary with next door, although the Planners sometimes like to see extensions set back a metre or so to allow access. Windows and glazing: The Building Regulations limit the amount of new glazing to an area equivalent to 25% of the extension’s new floor area (plus an allowance for any windows blocked off by the extension). Although there are ways to get around this rule, it’s a lot simpler to make your design comply. The Planners may also require any new side windows that overlook the neighbour’s property to be obscure glazed to preserve privacy. It is essential to get plenty of light into the extension for a pleasant, bright feel. It’s also important to retain as much natural light as possible to the original rear rooms once they’re enclosed by the extension. This is easy to achieve in single storey extensions generously endowed with roof-lights or solar light tubes. High performance glazed roofs are another option but are relatively expensive and can make it hard to comply with heat-loss rules. With a side return infill extension consider opening up the original back wall to the dining room to create a ‘seamless flow’. Alternatively remove the existing French doors or convert the rear window opening into a doorway. Technically it’s important that extensions don’t block the flow of air under Victorian timber ground floors, so air bricks will be required to the lower walls.